If you’re a parent or teacher who grew up in B.C., odds are you probably have taken part or watched a Speech Fest in your day. You’ll remember students waiting nervously, then walking up to the microphone, and finally getting the courage to share a short speech that they’ve been reciting for weeks. For those that don’t know, courage is one of the core values of the Langley School District. Last Friday, R.C. Garnett held its annual Speech Fest. Before the school wide event, the students practiced in front of their peers and gave each other feedback. In teacher terms, it was a type of formative assessment. Then came the big day! I have Down Syndrome but that’s NOT who I am. She had photos in her hands to guide her on what to say next. 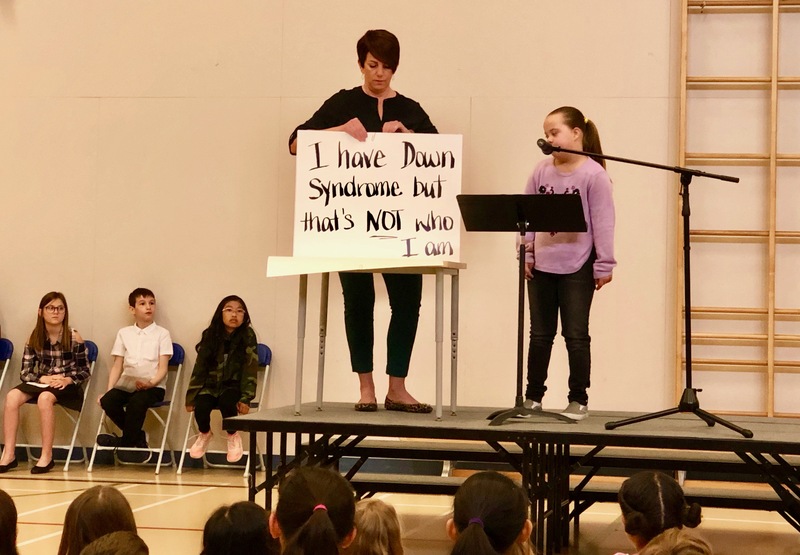 Her Special Education Assistant held cue cards to prompt her as well. Even with the aids to help her, the audience wasn’t really focused on those things – they were really just watching her. Her speech was near perfect! The crowd erupting in cheers at the end was an indication of that. It’s fair to say some of the adults in the back may have shed some tears of joy and pride. It was really exciting to be in the room. The judges deliberated. They announced Leaellyn won third place which triggered widespread shouting of praise and encouragement in the gym. Leaellyn jumped up and got her medal. She went back to sit with her peers and was flooded with hi-fives all around. Anyone who was in that room, didn’t just learn about inclusivity – they lived it!